Just Jingle: It's Christmas Eve Eve!!!!! Yup. The day before Christmas Eve is Christmas Eve Eve. Just say'n. I have to work today, which is a bit of a bummer, but, alas, I shall live. HA! I think I will leave early, though. I mean, afterall, it IS Christmas Eve Eve! Squeeeee!!!!! I want to show you the little calenders that I made for my co-workers as Christmas gifts! I got the cases and the print out (I bought the kit, so mine were printed, but I have the PDF file, too) from Little Potato House! This was a coffee table project - TV made it more fun! YAY! I began with a stack of 12 ink colors, 12 stamp selections, several calender sheets that I had already cut, and a handful of appropriately sized blocks, and then I went to town to create these! Oh...and beer. Definitely beer. Just say'n. HA! 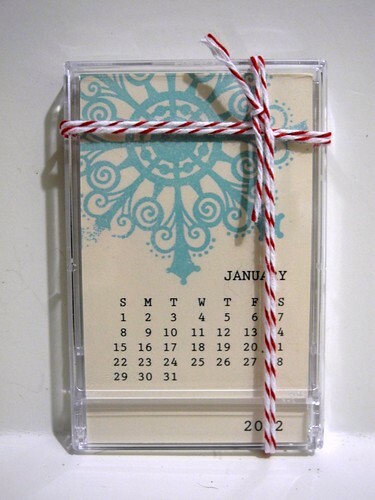 Adorable little business card sized desktop calendars!!! SO CUTE!!! I love them. Just say'n. Each page is stamped in some way to represent the month. I had fun picking out the stamps and colors! Yup. There is the full year of cuteness! YAY!!!! Okay, so just because I know someone is bound to ask...here's the rundown on stamps and colors used. All ink is CTMH. Just wrapped 'em up with a bit of twine and they were off! Well, that's all for today. I do have a post planned for tomorrow, despite the holiday, but just in case you don't get around I want to wish each and everyone of my readers a WONDERFULLY Happy Christmas!!!! Thanks for being awesome and reading my blog and stuff. You are so appreciated! SO love these!! Where do the stands come from??? 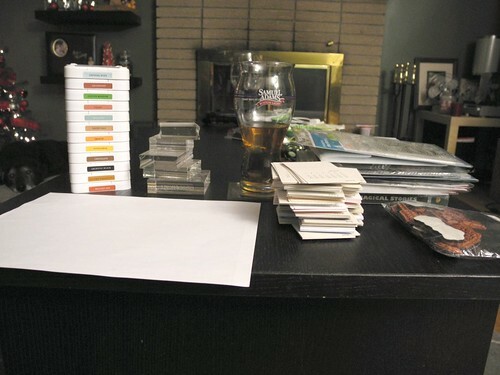 I love how you've gone from your fabulously messy art desk to now the living room coffee table! LOL I do the same thing, poor hubby occasionally has projects drying on the breakfast table...great combination of varnish vapours with cereal flakes! Adorable gift project!!! I really like this and it leads me to all sorts of ideas:) You have a plethora of talents and ideas Jennifer and I always enjoy seeing what you come up with next! These are so cute...I actually thought one of the cards you posted yesterday was a calendar until I clicked on it and saw it was stickles. So I think it is funny that today you actually post a calendar! Merry Christmas. 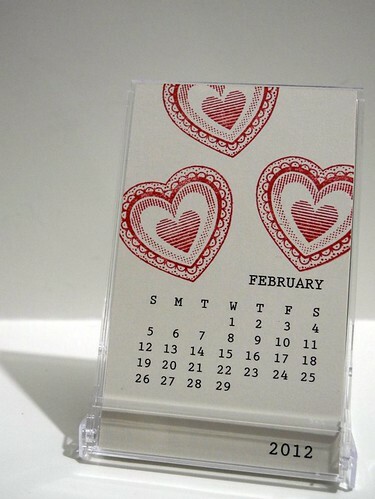 CUTE....did you print the calendar portion on your printer? EXcellent idea. Those are fabulous!! I might need to make some Bliss Habits version.... you have inspired me!! It is Christmas eve eve at our house too!! This is FANTASTIC!! Love this cute idea! Thanks for sharing and have a great holiday! Just got home last night but trying to steal some moments to catch up with bloggies before the first of my company arrives at 11 today. I have people arriving ALL evening, through tomorrow night. THEN a few coming just for Christmas dinner. Gloriaski! So LOTS to do! But I read all your posts for the week & loved both your projects AND YOU, YOU, YOU! Merry Christmas, happy lil' Jingle-girl! I just absolutely think you should be cloned, passed around to the world, and allowed to make EVERYONE as glad as you make ME! OMG, soooo cute!! What a great idea, where did you get the stand to hold them? Where do you work? I wanna job just so I'd get one of those ADORABLE calendars. Hmmm, I might do this next year -- ok? What are you using for a stand for them? Just ask'n...... heee. I love your just say'n.... LOVE IT! Awesome! I want to come work with you! You're so creative, Jennifer --- great gift! Merry Christmas! Totally loving these calenders and how you decorated them. Oh these ARE adorable. I may have to try this! Merry Christmas! What an awesome idea! Merry Christmas to you Jingle! very nice awesome.... what size is the completed album.. thanks..
Super cute, Jingle! Love the variety of images you used. Merry Christmas! These are such a cool idea!!! Youre so creative! what a good idea. Merry Christmas to you and your family my friend!! Oh maaaan, I wish I were your coworker!